Twitter went down Tuesday morning on the 19th January, UK time, and became inaccessible for users around the globe. The site apparently suffered a total outage with access to the service failing on the web, mobile and its API [application programming interface, the system that applications use to speak to the Twitter service] at 08:20 GMT. Users received error messages warning the network was both "over capacity" and suffering an "internal error". Twitter's own status board updated at 09:00, confirmed the outage, and the company's developer-facing monitoring confirmed that four of the five public APIs were down, suffering a "service disruption". At 08:47, the search API was upgraded to "performance issues". By 08:55, a second API was upgraded to "performance issues", and some users were able to sporadically access the service. 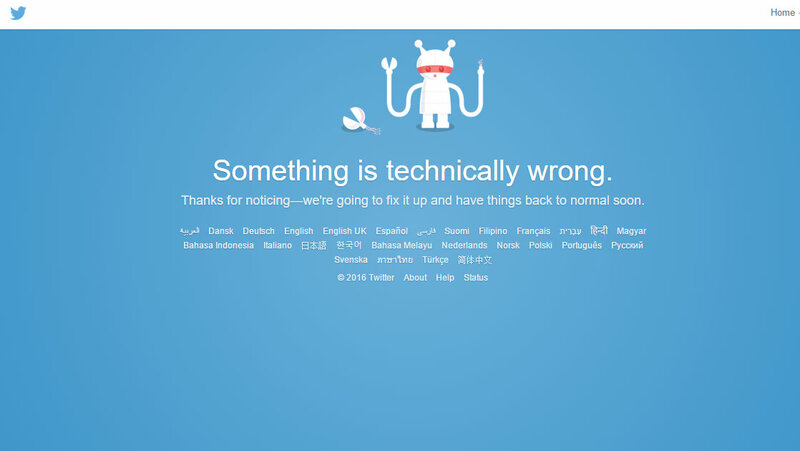 The company initially confirmed the outage by, somehow, tweeting, from its @support account. The tweet could not be seen however because Twitter was down. Twitter emailed the text of the tweet to news outlets, which read: "Some users are currently experiencing problems accessing Twitter. We are aware of the issue and are working towards a resolution." The service was still down at 09:30 at the time of posting this article. Update: Twitter became accessible for most users within two hours. However the downtime seriously affected the company's credibility and its stocks slumped to an all time low, falling some 8.4% to $16.43 on Tuesday, well below the price of $26 at its November 2013 initial public offering.